It's 1977. Fifteen-year old Vinnie isn't having a good year. He's recovering from the worst case of galloping acne his dermatologist's ever seen. His girl moved to California without even saying good-bye. And the ink on his parents divorce papers is barely dry, when his mom announces that they're moving from Queens to Long Island. The silver lining in all this is that they move next door to Patsy—everyone's dream girl. Not that she'd ever notice him. But when Vinnie calls Patsy one night, it leads to a chain of anonymous midnight conversations. Under the cover of darkness, Vinnie becomes Vincenzo, Patsy's mystery caller, and the two share a side of themselves they would never reveal in daylight and develop a surprisingly real connection (despite the lies it's built on). As Vinnie gets to know Patsy in real life though, it becomes clear both identifies can't survive and he'll have to find a way to hangup the phone and step into the daylight. 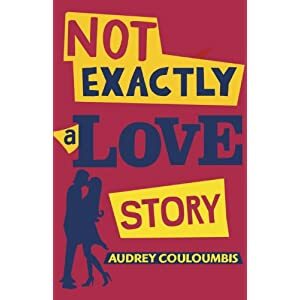 Fraught with complications and crackling with witty dialogue, and all the angst and electricity that comes with always being just a phone wire away from the one you want, acclaimed author Audrey Couloumbis's YA debut is a smooth-talking Cyrano meets Saturday Night Fever and tells a quirky, flirty, and smart story that will appeal to fans of Stephen Chbosky's The Perks of Being a Wallflower, Frank Portman's King Dork, Natalie Standiford's How to Say Goodbye in Robot, and John Green's An Abundance of Katherines. It's not exactly a love story . . . but it's pretty close. .. .
Another declined galley, but I'll just have to wait like everyone else. Though I've never read The Perks of Being a Wallflower, it's one of those books I'm convinced I'd really love. So the favorable comparison bodes well for this book. The first couple sentences caught me. Galloping acne? Okay, sounds like something humorous in store. Besides, it's just such a silly, cute set-up that it's bound to be adorable. And, yes, sometimes I love adorable. Shh. So check it out. It's not on Goodreads yet, but the author is! Reminds me . . . I need to obtain a copy of The Perks of Being a Wallflower . . .
Glad to have introduced you to a new read!